Our sewage clean up services are for homes and businesses with water damage caused by a sewer back up or leak. We are specially trained and equipped to deal with toxic material and remove it completely from your home or business. We deal directly with insurance companies to relieve you of the hassle and get started quickly. We will remove affected flooring, baseboards, drywall, insulation, beams, and any other materials damaged by the flood. When dealing with any type of water damage, the drying process is very important. Our large inventory of drying machines and de-humidifiers will dry your home or business quickly and effectively, leaving no signs of excess humidity. Our drying equipment will be set up for several days to ensure the the home or room is completely dry. Germs, mold and bacteria can be a concern after a sewer floods your home. We use an anti-microbial spray on all construction materials to kill anything that may be harmful to your health. The moisture levels will be double-checked after drying your home. New flooring, drywall, baseboard and electrical outlets that were removed during the sewage clean up will be replaced. We will paint and finish all finished surfaces to their original quality. We will also put all of your unaffected furniture and belongings back in each room and haul away the debris. 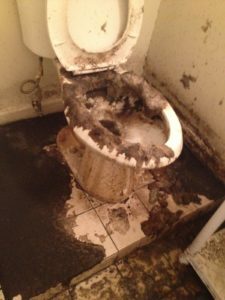 Call us now at (877) 645-1428 for your sewage cleanup needs.